“Every major change in our society has originated with or involved university students. That is why it is so important to educate and involve students in the mission to end hunger in our lifetime,” said Rod Brooks, Chief Executive Officer of Rise Against Hunger. 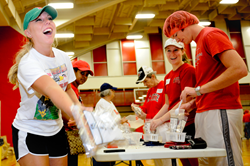 For the 10th year, Rise Against Hunger and the North Carolina State University Center for Student Leadership, Ethics and Public Service (CSLEPS) will invite students from across North and South America to apply for the World Hunger Leadership Award. The World Hunger Leadership Award recognizes the commitment of students who are dedicated to ending hunger, poverty reduction and related causes. The cash award, previously endorsed by the Clinton Foundation, was created in 2009 to honor a visit by President William Clinton to North Carolina State University. To memorialize the trip, Rise Against Hunger and The North Carolina State CSLEPS utilized their partnership to create a scholarship, formerly known as the Clinton Hunger Leadership Award. The award will be presented at the Universities Fighting World Hunger Summit in in Maine, March 15-16, 2019. All students dedicated to philanthropic work who are a committed to ending world hunger are welcome to apply. Must be an enrolled undergraduate or graduate student at an accredited post-secondary institution in North or South America. Must show demonstrated leadership in the fight against hunger. Must pledge a commitment to a life of service in the area of hunger, poverty reduction or related area. Winner must be available to attend the Universities Fighting World Hunger Summit in Maine, March 15-16, 2019 upon final selection. Visit http://www.riseagainsthunger.org/hungeraward to download and complete an application. Return your application information form, essay responses and recommendation letter to Rise Against Hunger Advocacy Consultant Susan Hill as a PDF by email (scortshill@riseagainsthunger.org). Up to three finalists may be asked to participate in a video interview or to submit a one to five minute video describing your involvement in the hunger space. Rise Against Hunger will provide the recipient a cash award to be used toward educational purposes in hopes to further expand the student’s understanding and knowledge of hunger and other relative issues. Rise Against Hunger, an international hunger relief organization, aims to show the world that it is, in fact, possible to end hunger by the year 2030. With 28 U.S. locations and five international offices, the organization is committed to nourishing lives, providing emergency aid, empowering communities and growing the hunger movement. Rise Against Hunger has facilitated meal packaging of more than 443 million meals to be distributed to 74 countries around the world.